Are you an educator in the Philadelphia region? Bring your students to the Lantern for special weekday morning performances that will enrich your classroom curriculum! Learn more about student matinee performances and classroom residencies, offered throughout the school year at a signifanct discount – or FREE for schools that qualify. Your support is crucial to our mission of producing world-class theater while serving the Philadelphia community with our award-winning education programs. As our 25th anniversary season gets underway, we'd like to share with you some exciting developments here at the Lantern. We are thrilled to report that our audience grew over 40% last season. Of the more than 30,000 people who came to see a play at the Lantern, 25% were under the age of 25. Over 8,000 students from local middle schools, high schools, and universities attended a Lantern performance. Great theater experiences early in life help lead to a lifetime of enjoying and participating in the arts, and we are honored to have provided this first-time experience for so many young people. This growth continues: a new grant from the National Endowment for the Arts is allowing us to expand our educational residencies to ten high schools this year – up from six schools last year – making it possible to reach at least 1,100 students in their classrooms during the 2018/19 academic year. The Lantern has emerged as one of the most active and productive theater companies in Philadelphia. This season we will produce seven plays, including five plays for our mainstage subscription series, an original adaptation of Charles Dickens' A Christmas Carol, and our annual production of William Shakespeare's Romeo and Juliet created especially for high school audiences. Every dollar donated to the Lantern is leveraged into more and better artistic and education programming. We accomplish this as effectively as any performing arts company in Philadelphia because of the creative energy and organizational savvy at the Lantern – and because of your enthusiasm as audience members. Your donations are essential, and we are incredibly grateful for your support. Ticket sales cover about 40% of the Lantern's operating budget for our artistic and education programming. Please make a gift today and help us keep up the momentum onstage and in Philadelphia's classrooms. Every dollar makes a big difference. Join us! Questions? Please contact Maida Hanson-Wrigley, Development Associate, at 215.829.9002 x106 or mhanson@lanterntheater.org. Thank you for supporting the Lantern! Lantern Theater Company is a 501(c)3 non-profit organization. Our Federal Tax ID number is 23-2798692. Donations to Lantern Theater Company are tax-deductible to the fullest extent allowed by law. The official registration and financial information of Lantern Theater Company may be obtained from the Pennsylvania Department of State by calling toll free, within Pennsylvania, 1-800-732-0999. Registration does not imply endorsement. 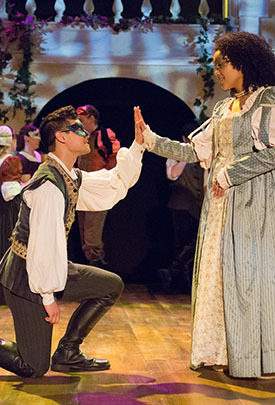 Pictured: Tyler Elliott and Melissa Rakiro in Romeo & Juliet (2018). Photo: Mark Garvin.